Designed for electric guitarists and bass players, the Two Notes Torpedo Reload is a multi-impedance loadbox, a DI box, a power attenuator, and a re-amping box, all in one enclosure. Thus, it is especially suitable for studio musicians who wish to record guitars effectively, efficiently—and when the scenario calls for it, quietly. 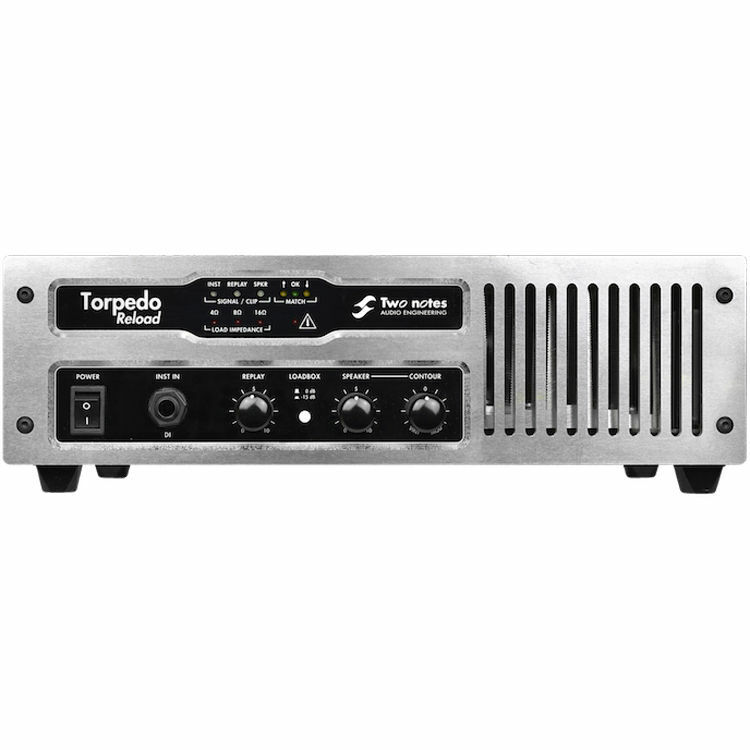 The Loadbox component of the Torpedo Reload interfaces with your favorite preamplifier to protect its circuitry, using reactive technology to emulate the complex handling of an actual, corporeal speaker while doing so. Quite often—and especially with amps not sporting fuses or other protection systems—failure to connect an amplifier head to a speaker cabinet can cause significant problems to the output stage of your amp. 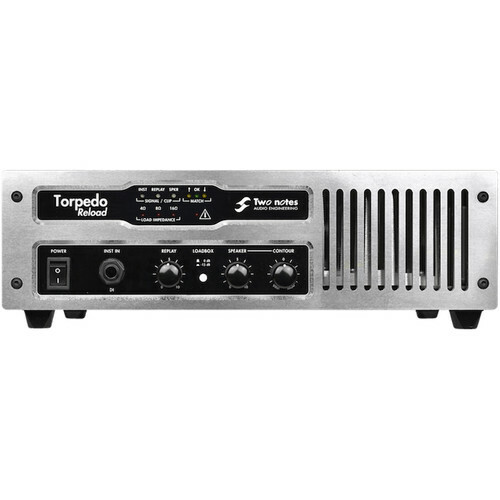 Plugging into the Torpedo Reload solves this problem effectively, as it handles the electrical load of your preamplifier (hence the term “loadbox”), dissipating the amplifier’s power, and giving you an authentic response as it reacts to the output stage of your amplifier head. With the Torpedo Reload, many recording options are presented to you. You can record through your favorite preamp, take that tone into your DAW, and utilize one of the included 24 cabinet responses within Two Notes’ Wall of Sound III plugin. If time-of-day volume is the issue—and you’d still like to mic your own cabinet at a later date, then the Torpedo Reload will also come in handy. Simply track through the Hi-Z Input, and then, when you’re ready, use the Reload’s Replay system and Match technology to attenuate audio coming out of your DAW’s interface to a level better suited for plugging into an amplifier. Then, the path goes as follows: you route audio from the DAW to the Reload, route signal from the Reload to your amplifier, mic the cabinet however you’d like, re-record the resulting sound back into your DAW. Controls such as a Replay level knob, a speaker-attenuating volume knob, and a contour knob round out the unit. You’ll find the contour knob useful in conjunction with attenuating the unit; turn it left, and you’ll get a vintage tone with a rich, midrange-focused timbre. Turn it right, and you’ll hear more bass and treble. For connections, you’re provided with a 1/4" Hi-Z instrument input, a 1/4" speaker input, two 1/4" speaker outputs, an XLR Loudbox output, and an XLR DI output; with this complement, you can route processed sound to your DAW, unprocessed sound to your DAW, unprocessed sound to your speaker cabinet, all at the same time. This is leaving out the Replay section, which provides its own 1/4" I/O for communicating with your DAW and your amplifier while you’re re-amping. The Replay section, Loadbox output, and DI output all have ground/lift switches to eliminate ground hum. Attenuators are usually known for the negative impact they have on your tone in cases of heavy cuts. However, Two Notes' Reactive-Active technology presents your amplifier with a consistent speaker's impedance, thus preserving the specific sonic character of your amplifier. With a choice of 4, 8, or 16 Ohms, any amplifier up to 150W will effectively "see" real speaker impedance, and your tone will remain constant throughout the continuous attenuation curve. From 0 dB attenuation to total silencing, you can choose between absolute transparency in your level reduction, or effect more vintage and modern tone-coloring via the Contour knob. If you want to re-amp a DI'ed signal at a later date, the Torpedo Reload gives you ample opportunities for that. Simply plug your guitar into the Hi-Z DI Input and send that signal to your interface. The box will preserve your guitar's tone, letting you re-inject it into your amp through the REPLAY whenever your ready-an output which automatically takes care of the most difficult part of re-amping: Level-matching your DAW's output with your amplifier's input. This common problem is solved thanks to the Torpedo Reload's Match technology. This solution handles the problem of level adjustment when re-amplifying. If the level from your DAW is too high, your amplifier will tend to over-saturate. If this level is too weak, the tone will lack dynamics and liveliness. Match compares the signal as it comes from any guitar (plugged to the DI input) with the signal that has been recorded (and which is sent to the Replay line input) so that what you send to the amp is the ideal level only. Now you can be sure that the signal you send from the DAW is exactly what your guitar itself would be sending. You may even use Match with two different signals: If you have a previously recorded track, for instance, but do not have the guitar with you, simply plug a similar guitar into the DI In and match it to the signal. Included with the pedal is a license for 24 virtual cabinets for use with Wall of Sound III, a speaker and microphone-placement emulation plugin. This plugin works in DAWs such as Cubase, Logic Pro X, Pro Tools, and more. Using this software, you can recreate the full complement of a guitar sound, from the preamp of the pedal to the 16 cabinet responses usable in Wall of Sound III. This plugin not only provides cabinet emulations, it also offers power amplifier models, microphone simulations, mic pre-emulations, and mic-positioning possibilities. Box Dimensions (LxWxH) 18.2 x 11.3 x 7.7"